Part of the Margaret Barclay Wilson collection of cookbooks and cookery, Cakes and Ale at Woodbine: From Twelfth Night to New Year’s Day is a pseudonymously published light novel of mid-century Fordham, New York. Ostensibly the work of “Barry Gray,” the book was written by Robert Barry Coffin (1826–1886), one of the “Bohemians” of antebellum New York. [i] He was a critic for, and eventually editor of, the Home Journal, later renamed Town and Country, which continues in publication to this day. This book was first published in 1868; the Library’s edition is from 1883. The “cakes and ale” of the title is not culinary, but purely literary. On the title page is this quote from Shakespeare’s Twelfth Night: “Dost thou think, because thou art virtuous, there shall be no more cakes and ale?” (Act 2, Scene 3). Sir Toby Belch uttered the line “Dost thou think, because thou art virtuous, there shall be no more cakes and ale?” the epigram for the novel. This is an image of Lionel Brough in a 1901 production. “Cakes and ale” are not only mentioned in Twelfth Night, they are parts of Twelfth-Night celebrations: the merriment on the day of (or day before, depending on how one count) the feast of the Epiphany on January 6, the twelfth day after Christmas. Coffin is therefore having fun with the title, “From Twelfth Night to New Year’s Day,” as it means from January 6 all around to January 1: a romp through the year, touching on all the major holidays in turn. Each day is an occasion for indulging in cakes and ale, “the good things of this life” (p. 13): Epiphany, the first day of spring, a birthday, Easter, the fourth of July, “summer,” Christmas and a Christmas wedding, and then New Year’s. The virtues of the country always win out, in grand matters of love, and more prosaic ones of cakes and ale. May you have a great holiday season, and may you get all the cakes and ale you want! Another literary retreat, left, the Edgar Allan Poe house in Fordham, New York, where the author lived from 1846 to 1849, some 20 years before the recounted events in Cakes and Ale, also set in Fordham, a village only recently connected to the city by rail. Right, a view of the Poe cottage in its rural setting. [i] “Gray, Barry (1826–1886) [Robert Barry Coffin],” in “The Vault at Pfaff’s: An Archive of Art and Literature by the Bohemians of Antebellum New York,” https://pfaffs.web.lehigh.edu/node/54192, accessed December 22, 2016. Lionel Brough as Sir Toby Belch in Twelfth Night, accessed December 22, 2016. 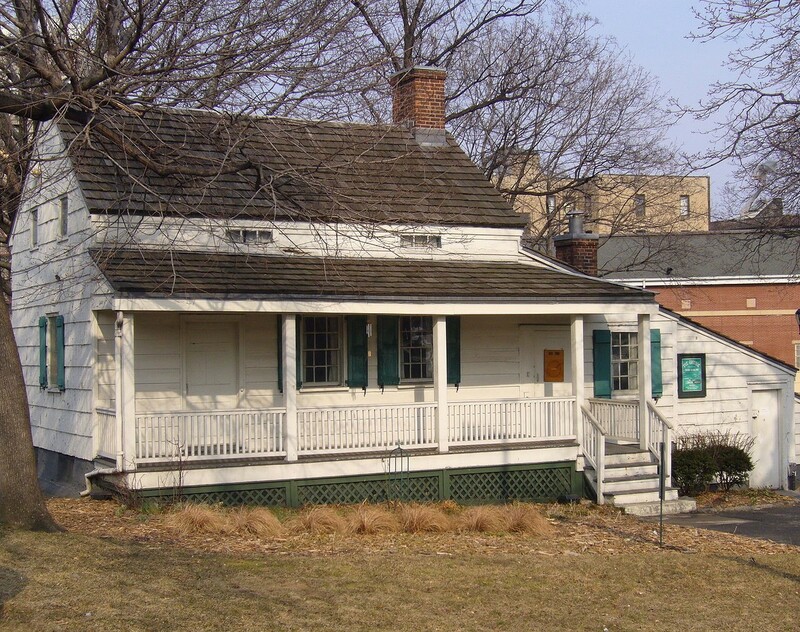 Edgar Allan Poe Cottage, Fordham, New York, image from 2007, accessed December 22, 2016. 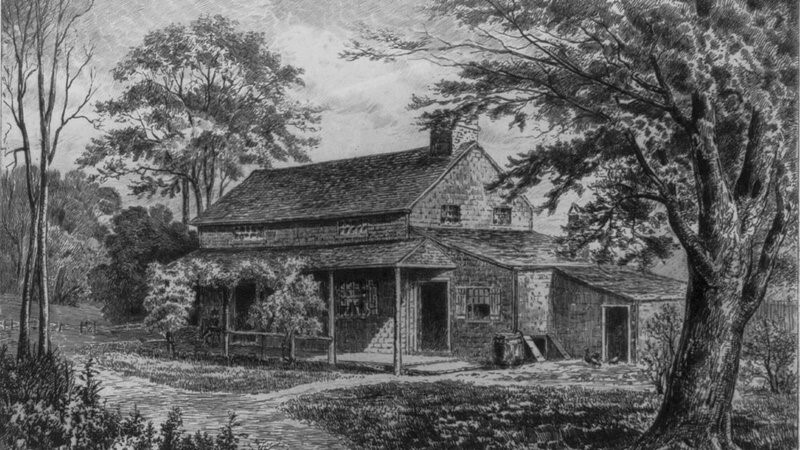 Edgar Allan Poe Cottage, Fordham, New York, engraving, accessed December 22, 2016. Welcome to my celebration of one of our collections’ unsung heroes – not a specific book, or author, but a punctuation mark that decorates many of them: the manicule. 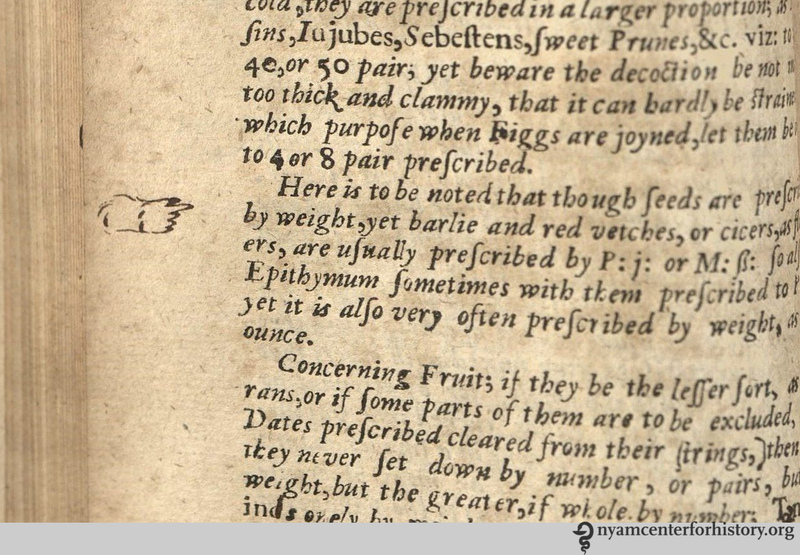 As you can see from the example above, the manicule is a disembodied, pointing hand. In case this, as in many, the manicule also has a little cuff, and a fingernail on the pointing finger that is visible, too. This manicule comes from our Anatomia Carpi by Jacopo Berengario da Carpi, a 16th century Italian physician. The manicule gets its name from the Latin maniculum for “little hand.” This connection with the actual human body is apparent in some of the other names of the symbol: fist, printer’s first, bishop’s fist, pointer, pointing hand, even mutton-fist. Its usage starts around the 12th century, though there is a record of it appearing in the Domesday Book of 1086 in John Johnson’s Typographia. It’s certainly compelling to think of the manicule mark as the descendent of an oratory pose and natural human gesticulation. Manicules are windows into people’s relationships with their books and texts. Time was taken to read the passage, react to it and record or reference it by hand on the page, which makes sense given the tremendous amount of work, time and expense it once took to get a book into your hands. Keith Houston, author of Shady Characters, observed readers’ investment and attachment to their books was quite unlike the modern day consumer. “It was second nature for a book’s owner to brand it, to annotate and embellish it as they read; to underline pithy phrases and fill the margins with notes.” Indeed, the manicule isn’t really a punctuation mark, something put in by the author for grammatical structural or clarity. Rather, it’s a reader’s mark indicating something to that person – something that could be wholly mysterious, banal, or unimportant to me or you. 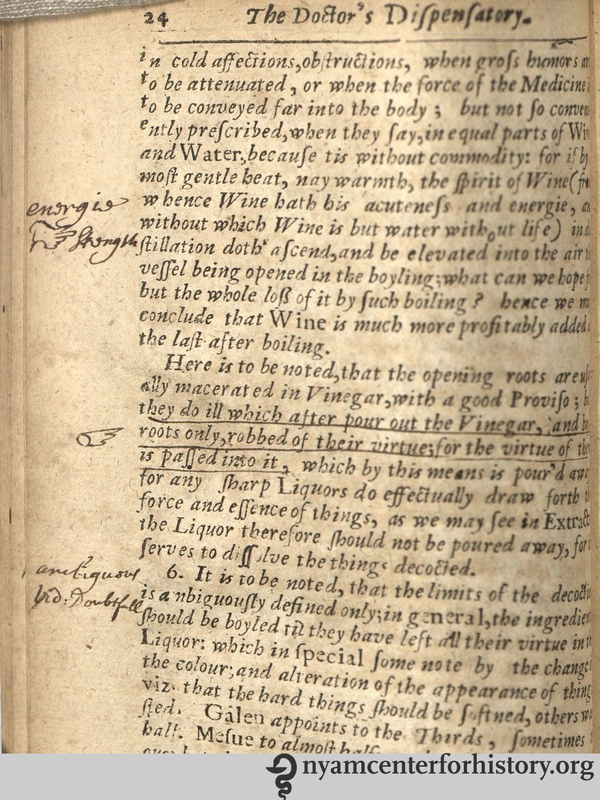 One past owner of our 1657 copy of The Doctor’s Dispensary found many points of interest in the book. Its pages are littered with marginal notes, underlining and manicules. This reader’s manicules are fairly simple, though they do include a cuff –or possibly a sleeve or an arm- while some examples can have long sleeves that drip down to mark the end of the passage of notable text, complete with shading on the clothing or secondary digits pointing things out as well. As intellectual and cultural knowledge fairly exploded during the Renaissance, ink flowed from readers marking up their books. Then came the world-altering printing press from Johannes Gutenberg in 1440 in Mainz, Germany. Readers continued to annotate their printed books just as they had their handwritten ones; and printed manicules joined the handwritten ones on the page. Printers inserted in-line manicules that indicated authorial notations that were not the readers’ own commentary, subtly (or not) guiding a reader to the ‘correct’ interpretation of the work. Printed manicules became more prominent as authors and publishers took advantage of a means to protect the integrity of their work. The manicule drawn in by hand more or less died out by the 19th century. The mark lived on in its printed form and got almost annoyingly ubiquitous by the end of the 19th century. Manicules were a bread and butter symbol for advertising typography where they literally pointed the way to headlines, punchlines, venues and notable names. They were even on gravestones, pointing the way to heaven. This gravestone photo from a Virginia cemetery was snapped by literature professor and medievalist Jonathan Hsy of George Washington University. The public visually overdosed on the manicule as this point and it fell from such frequent (over)use. The manicule is definitely still around though; on returned envelopes from the US postal service, in design products seeking to impart a vintage flare and in directional signage. And of course in the newest frontier of information and communication; the digital screen where the computer’s cursor was, and sometimes still is, a hand pointing the way. Sherman, William H. Towards a History of the Manicule, 2005. Accessed November 22, 2016. McPharlin, Paul. Roman numerals, typographic leaves and pointing hands: some notes on their origin, history and contemporary use. New York: Typophiles, 1942. 47. Houston, Keith. Shady Characters: The Secret Life of Punctuation, Symbols & Other Typographic Marks. New York: W.W. Norton & Company, 2013. 170. Palmer & Rey. Palmer & Rey’s Type Specimen Book. San Francisco: Palmer & Rey, 1887. McPharlin, Roman numerals, 1942. 65. In the 19th and early 20th centuries, medical schools offered academic prizes, frequently accompanied by a monetary award, for the best essays, examinations, and student notebooks. The New York Academy of Medicine’s Library holds several examples of prize-winning student medical notebooks, including John E. Stillwell’s Report of Prof. Thomas’ Gynecological Clinics, Session of ’73 and ’74. This notebook is an ornate presentation copy, not the rough notes Stillwell would have taken during the clinics. Written in a neat, legible hand, it also includes a calligraphic title page and twenty-nine watercolor illustrations. The notebook is bound in full leather with blind-stamped fleurs-de-lis and shamrocks on the cover and spine. The notes are from a series of clinics offered during the 1873-1874 school year by Theodore Gaillard Thomas, a professor of gynecology at New York’s College of Physicians and Surgeons and author of A Practical Treatise on the Diseases of Women. Calligraphic title page of John E. Stillwell’s Report of Prof. Thomas’ Gynecological Clinics: autograph manuscript, 1873-1874. 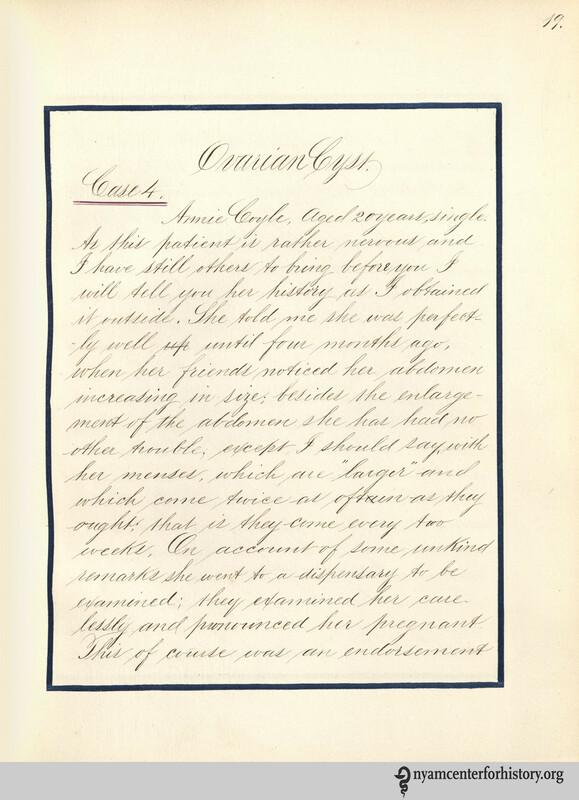 Stillwell’s carefully transcribed lecture notes and a watercolor showing a woman with an ovarian tumor, from Stillwell’s autograph manuscript, Report of Prof. Thomas’ Gynecological Clinics, 1873-1874. Dr. Thomas notes that he found an abdominal tumor and gives details on how he determined that it is a “fluid tumor” rather than one “that is filled with air or that is solid.” He rules out pregnancy because he cannot feel any movement when he places his hands on her abdomen and her mammary glands are not enlarged. His conclusion is that she has an ovarian cyst and requires an ovariotomy to remove it. 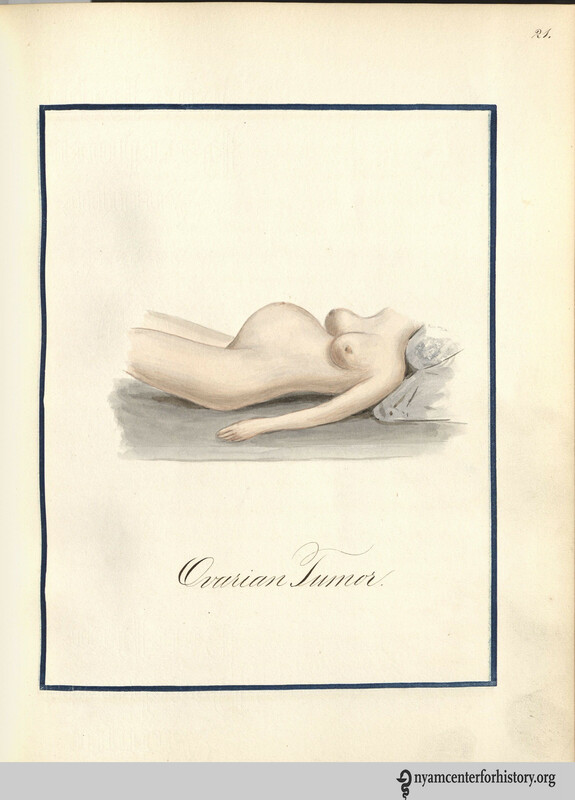 Stillwell’s account of the clinic is accompanied by a watercolor of a female figure with an enlarged abdomen labeled, “Ovarian Tumor.” Other clinics in the notebook cover problems of the uterus and cervix, tumors, peritonitis, fibroids, complications during and after pregnancy, menopause, dementia, and sterility. There is even an account (with an illustration) of a woman who has two vaginas. Watercolor by John E. Stillwell of a retroflexed uterus, from his Report of Prof. Thomas’ Gynecological Clinics, 1873-1874. Stillwell’s prize consisted of a full set of gynecological instruments stored in a sturdy wooden box lined with purple velvet. The instruments were made by G. Tiemann & Co., Manufacturers of Surgical Instruments, 67 Chatham St., N.Y. The tools include all the necessary implements for a gynecology practice in the 1870s. Thomas describes many of the tools in his A Practical Treatise on the Diseases of Women (which was a required textbooks for medical students at the College of Physicians and Surgeons around this time). 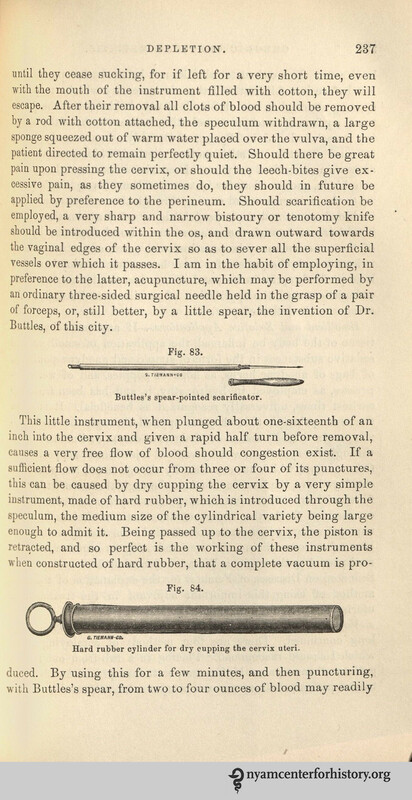 Shown below are drawings of several of the tools, including “Buttles’ spear-pointed scarificator,” a “hard rubber cylinder for dry-cupping the cervix uteri,” cauterizing irons, and tools for sutures, and descriptions of how they were used. 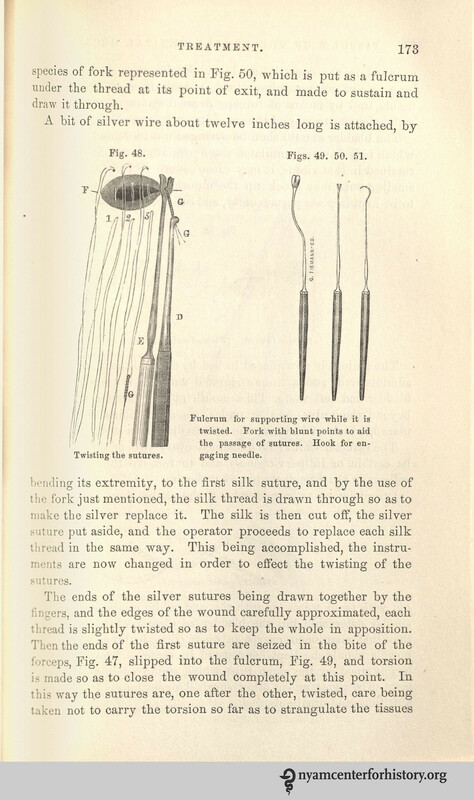 Taken from T. Gaillard Thomas’s A Practical Treatise on the Diseases of Women, 2nd ed., these drawings show obstetrical tools and give brief descriptions of how they were used. 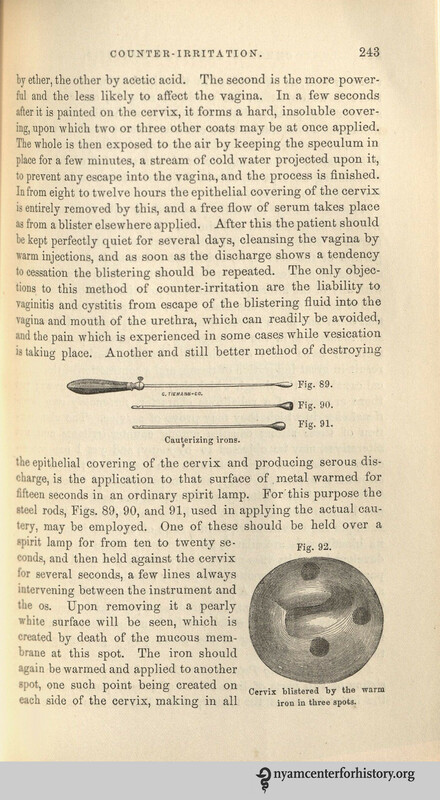 Taken together, John E. Stillwell’s prize notebook and the handsome case of obstetrical tools that he won for his efforts provide an interesting window into both 19th-century medical school competitions and 19th-century obstetrics and gynecology. Contemporary handbooks from medical schools list the types of prizes awarded and the prize money attached to them. See, for example, the section on “Prizes” under “School of Medicine” in Columbia College’s Handbook of Information as to the Several Schools and Courses of Instruction 1886-1887, p. 222-225. An account of the commencement exercises of the College of Physicians and Surgeons in The Medical Record confirms Stillwell’s receipt of the Thomas prize. “The Thomas prize was awarded to J.E. Stillwell, for a report on ‘Cliniques for Diseases of Women’” (The Medical Record, ed. George F. Shrady, New York: W.M. Wood & Co., v. 9, issue of March 16, 1874, p. 158). Thomas, Theodore Gaillard. A Practical Treatise on the Diseases of Women, 2nd ed. (Philadelphia: Henry C. Lea, 1869). 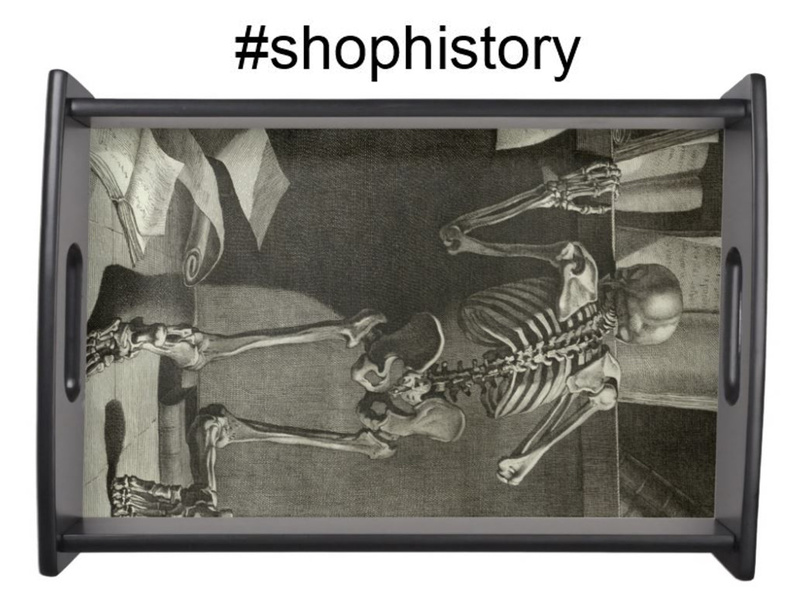 Search no further for one-of-a-kind gifts for the medical history buff in your life: the Library’s online shop has you covered with over 3,000 products to choose among. Find a few of our favorites below. And take an extra 15% off as our holiday gift to you: use code ZAZZLETHANKS at check out. This sturdy tote bag with a vintage advertisement for Tolu’s Rock and Rye cough tonic – good for what ails you. And groceries. Our skeletal musicians give a whole new meaning to death metal. They might be from 1779; but our headphones are totally 21st century with a 20hz – 20,000hz range, built-in answer button and microphone to seamlessly take calls, and vegan leather padding. This cheery orange fruits and leaves lunchbox includes a large sandwich container, two small containers and an ice pack. Dishwasher safe and BPA-free. Mangia! Speaking of eating, food goes great with wine. These wine charms featuring skulls by 16th century Flemish anatomist Andreas Vesalius go great with glasses of wine. Since red wine is good for your heart, admire this panel of an exquisite engraving of an anatomical heart by Scottish surgeon Charles Bell on your wall while you sip. This flask is from a New York-based surgical supply company’s turn of the century catalogue. Chemistry-lovers, you’re welcome. Never be too far away from a good book with this rather cellular-looking red marbled book endpaper wallet. Take ‘digital’ back to its roots of actual fingers with this artificial hand by French surgeon Ambroise Paré on your laptop case. Just in case you feel naked without your actual stethoscope around your neck: this tie. Baby, it’s cold outside! Magnify your warmth by snuggling up with these microscopes. Lastly, for the person who really and truly has everything already—or more likely just has no space—give the gift of membership to our Friends of the Rare Book Room, the people and programs that explore and support the books where all these remarkable images come from. All proceeds from the shop support the library’s collections’ preservation and public programming, and all Friends memberships are tax-deductible. Happy Holidays!